K-Sun PearLabel 360 Label Printer - The K-Sun PEARLabel™ 360 with MaxiLabel® Pro Ver.4.0 Labeling Software is Windows 7/8 and Mac® compatible. It's a new 360 dpi, wide format, heat shrink tube, wire wrap, and general industrial thermal transfer labeling system. Prints on 126 different heat shrink tube and special labeling materials in sizes ranging from, 1/6" (4mm) to 1.5" (36mm) for labeling tapes and 15 heat shrink tube sizes and colors ranging from 1/8" up to 1/2" (AWG size range 1-22). PEARLabel™ 360 uses K-Sun LABEL Shop® tapes and Heat Shrink Tube cartridges plus new wide format 1.5" (36mm) sizes. Printer features a revolutionary edge trimmer called PeelGuard® that rounds sharp corners making labels stick better reducing waste. Unique margin setting function allows users to reduce unwanted margin spaces down to 1mm, saving tape cost and waste when printing multiple labels. Simple to use software makes 15 different popular Bar Codes including the ability to custom design and print QR and DataMatrix 2-dimensional bar codes. MaxiLabel® Pro Ver. 4.0 has 839 built in symbols (ANSI, IMO, PPE, Target Organs and Signal Words) for creating safety signs and labels. 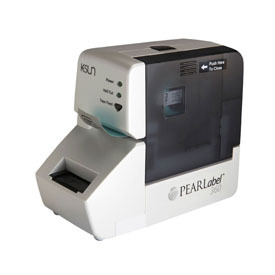 PEARLabel™ 360 has mobile printing capability with new K-Sun labeling app for iPhone® and iPad® devices.